[Lantern team has announced that they will be shutting down the Lantern app as of 12/31/2018. Until that time The Lantern app is moving over to maintenance mode and all coaching features have been removed. MinsTools.io is keeping the program description and evaluation as an historical record]. 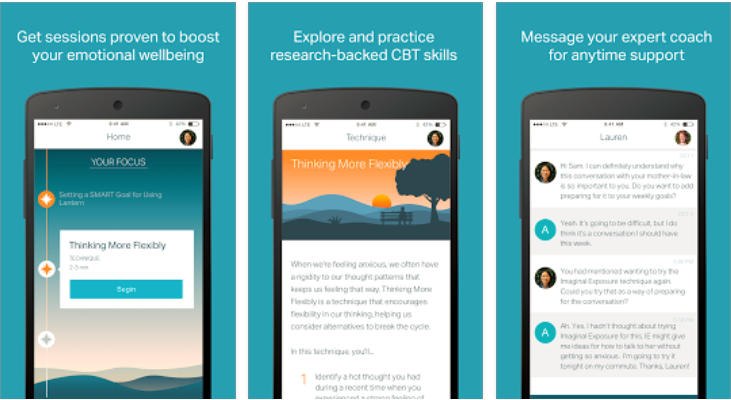 Lantern is a mobile app aimed at assisting users with anxiety, depression, and body image through methods derived from CBT and mindfulness. Upon first entering the program, users must complete a short screening and preference questionnaire to establish the baseline level of anxiety they are dealing with. The program then uses this information to recommend the frequency of use. Accompanying the program is a live coach who is available through text messaging and is committed to replying to the user’s text messages within one business day. Phone calls are also available if needed. The program is designed as a series of steps, each of which includes short (5–30 min) learning or practicing methods and skills. Most information is text-based, with some interactive exercises that require the user’s personal input (e.g. goal setting, thought challenging). All input is reviewed by the personal coach, who can then comment and assist based on his or her judgment. Easy to follow/ live coach assistance. Lantern is an easy-to-follow app that is most suitable for users dealing with mild to moderate symptoms of anxiety. The program’s guidance administered through the series of steps is brief and clear, and suitable for mobile devices. However, the program’s biggest advantage derives from the “live coach,” who promotes users’ motivation and assists in ongoing support as needed. Compared to most CBT-based digital interventions, this element contributes greatly to the overall experience. On the downside, although short and to the point, the text-based steps would be more engaging if they were delivered via another medium (e.g. video, audio). Lantern could be added as a supplement to treatment that uses similar therapeutic principles (CBT) for patients dealing with mild to moderate anxiety. The patient can use the program for practice between sessions, provided it correlates with the topics discussed within the session.